The elderly and people with a disability wishing to cross Wallace Street in the Macksville central business district (CBD) can only cross Wallace Street safely at the traffic lights at the intersection of Wallace Street with Cooper Street (Pacific Highway). A pedestrian crossing at the top end of Wallace Street in the vicinity of the Supermarket would enable the elderly and people with a disability to cross Wallace Street safety rather than trying to “flit” through traffic. Even though traffic in the Macksville CBD is 50 kph this is still considered very fast particularly for the elderly. A 40 kph speed limit is recommended and in keeping with traffic conditions in Bowra Street, Nambucca Heads. 1 That Council approve the installation of a pedestrian crossing on Wallace Street Macksville in front of the Supermarket. 2 That Council request the Traffic Committee to investigate the introduction of 40 kph speed limit on Wallace Street in the Macksville central business district. That Council not approve the installation of a pedestrian crossing. That Council not agree with the Traffic Committee investigating the introduction of 40 kph speed limit. Elderly people in particular find it difficult and unsafe to cross Wallace Street at the western end of the Macksville central business district (CBD) due to the often heavy and/or fast traffic flow. Currently the only option for a relatively safe crossing is at the traffic lights at the corner of Wallace Street and Cooper Street (Pacific Highway). However, this is often not suitable for the elderly as it is quite a walking distance from the Supermarket or Arcade particularly if shopping bags need to be carried or a walker or shopping trolley pushed. A local resident, has written to Council requesting the installation of a pedestrian crossing and a drop in the speed limit to 40 kph in the Macksville CBD, in keeping with that provided in Bowra Street Nambucca Heads. Copy of letter is attached. Our Shire has many elderly residents and if Council is promoting shopping locally then it needs to take into consideration of the aged and disabled community. There has been no further consultation. There is no implication on the environment. A pedestrian crossing in the vicinity of the Supermarket on Wallace Street, Macksville would provide a safe crossing for the elderly and people with disabilities. The slowing of traffic in this area would contribute to road and pedestrian safety. Better access to shopping on both sides of Wallace Street may provide an upturn in money spent by residents in shopping locally. The risk to Council may be that if these requests are ignored Council may be liable in the case of an accident caused to fast flowing traffic and no pedestrian crossing. A pedestrian crossing in the vicinity of the supermarket greatly impacts on parking spaces in Wallace Street. A copy of a plan showing a proposed pedestrian crossing is attached. The views of organisations such as the Macksville and District Chamber of Commerce and Industry should be sought. A 40 kph zone in a commercial area such as the one in Bowra Street Nambucca Heads is a “High Pedestrian Zone” and requires overall consideration of the affected street as slowing devices such as speed humps are often required at the start points. Council advertise by open tender the management and operation of the Macksville Aquatic Centre for an initial period of 2 years. Tender documentation currently being advertised – closed 16 April 2009. To be reported to Council’s meeting on 21 May 09. Deferred to 4 June 2009. Proposed sale of old Gumma Road sanitary depot be deferred to allow for further investigation of prior use. Report to next Land Development Committee meeting. Council receive a report on the released bond for the Wia-Ora sand and gravel quarry. Deferred to June 2009 to incorporate possible calling in of bonds. That the report on Council owned buildings for public use – essential fire measures be deferred to the next Council meeting for a report on the inconsistencies with maintenance costs for halls. To be considered in March quarterly budget review. That the list of grant programs and their status to 25 May 2009 be received. Pontoon and Gangway at Lions Park, Ferry Street – Macksville. Pontoon and Gangway at Tourist Office Finger Wharf – Nambucca Heads. Nambucca District Little Athletics – Computer, camera and filing cabinets. Nambucca Heads Junior Rugby League Football Club – Coffee maker and a step ladder. Nambucca Heads Touch Football – Computer and a photocopier. The Area Assistance Scheme (AAS) is a regional community development program run by the Communities Division, NSW Department of Community Services. The AAS provides grants to local Councils and non-government not-for-profit organisations for projects that improve community well being and how communities function. The AAS works within a whole-of-government framework to deliver its outcomes. In 2008/09 the AAS will funds project between $10 000 and $110 000. 1) Argents Hill Hall – Improvements to hall including general maintenance and structural works. 2) Marine Rescue Building – Funding towards the construction of a new building for the Nambucca River Marine Rescue services to store 2 boats, other equipment and provide training and use of a meeting room. 3) Warrell Creek Hall – Improvements to hall including insulating part of the building and adding exhaust fans, new floor coverings in kitchen, refurbishing of stage area, fencing and boundary restoration works, new footpath, water tank, installation of alarm device for the septic overflow tank, new bbq, shade area and picnic tables. 4) Unkya Reserve – Improvements including new switchboard, safety circuit breakers, power points and lights to resolve safety and power overloading issues, replacement of old canteen roof and guttering, water tank and plumbing equipment, tiling in canteen and toilet block. Eligible organisations can apply for grant funding ranging from a minimum of $1,000 up to a maximum of $5,000. An organisation applying for a grant under the Volunteer Grants Program 2008 must be an Australian, not-for-profit organisation that is a legal entity, engaging volunteers, whose work directly benefits Australian communities. 1) Nambucca District Little Athletics – Funding to purchase computer, camera and filing cabinets. 2) Nambucca Heads Junior Rugby League Football Club – Funding to purchase a coffee maker and a step ladder. Eligible applicants are those from local government authorities and incorporated not-for-profit organisations wishing to develop facilities that will increase participation in sport, recreation and physical activity. Local government authorities must submit applications on behalf of their committees e.g. Section 355 Committees. 3) Nambucca Valley Bridge Club – Funding towards new club house. 4) Scotts Head Bowling and Recreation Club – Installation of lights at bowling green. The grants will only be available for local government and must be used to either provide new playground facilities and/or equipment or upgrade existing playground facilities and/or equipment. Councils must utilise grants received for playground projects on land which is council-owned or managed. Funded playground projects must be free to use and publicly accessible. Projects will be funded in 2009/10 to a maximum of $20,000. All councils in NSW are eligible and encouraged to apply for funding under the program. There is a limit of one project application per council. Councils which were successful in receiving a grant under Round 1 of the Playground Equipment Upgrade may also submit an application under Round 2. An application was submitted to install border and softfall to Donnelly Welsh Park and Taylors Arm Sports Reserve. This program provides grants to non-metropolitan coastal councils to improve cycling facilities by developing and implementing the NSW Coastline Cycleway route. Councils can apply for dollar-for-dollar grants for projects on the defined NSW Coastline Cycleway route. Through the Local Adaptation Pathways Program, the Australian Government is providing funding to help councils undertake climate change risk assessments and develop action plans to prepare for the likely local impacts of climate change. Worth up to $500,000, Round 2 of the Local Adaptation Pathways Program seeks to complement and build on the work from Round 1. While all applications will be considered, this round of funding seeks to improve participation from local governments in Outer Regional, Remote and Very Remote regions. Consortia of councils are also encouraged to apply. · $140,000 (GST exclusive) for three (3) or more Councils. The funding will help councils integrate climate change risk assessment into their broader decision-making processes. A joint application has been submitted from Nambucca Shire Council, Kempsey Shire Council and Bellingen Shire Council. Further information has been submitted upon request of the Department. National Emergency Volunteer Support Fund – Emergency Management Australia (EMA), the Division within the Attorney-General's Department. Pre-approval to lodge a submission has been received for funding towards seating and signage for the Crosswinds Wetlands Reserve. An application has been submitted. Application forms and detailed information about the grants are available from the Department’s website. · increase the range of initiatives available to address road safety for Indigenous people. An application has been prepared to fund engineering works, informative signage at Bellwood and a children's safety booklet. $30m for water and energy saving projects in facilities open to the public eg schools, community buildings, sporting facilities, museums and art galleries. § stimulate investment in innovative ways to save, harvest and recycle water and/or reduce overall energy consumption (and related greenhouse emissions) and/or peak electricity demand. § projects which reduce the demand for electricity or water supplied from electricity or water supply networks, e.g. cogeneration, fuel switching, water recycling, stormwater harvesting. An application submitted for funding towards lighting and air conditioning system upgrade in Council’s Administration Building and six outdoor solar lights. This is complimented with funding towards a free community globe promotion and an educational information sheet. · small-scale projects of between $20,000 and $100,000 per annum. 2) Funding towards cycleway in Bellwood (Pacific Highway) in partnership with Green Team. to improve the capacity of eligible organisations to protect, restore and enhance the environment to undertake resource recovery and waste avoidance projects and to prevent and/or reduce pollution. Building the Country Package announced by the Rees Government. The funding programs are designed to support people who live and work in country areas. Creation and/or Presentation – Support for any stage in the creative development and/or public presentation of arts and cultural work. Strategic Industry Development – Support for projects with sustainable long-term outcomes for the development of the arts and cultural industry in NSW. Up to $50,000 per annum. This category assists groups to undertake projects in any art form that: extend knowledge, participation and/or development of arts and culture within communities; address cultural themes or issues of significance in local communities; are initiated by and with the community; provide opportunities for collaboration and skills development of locally based arts workers. promote partnerships that support community and cultural exchange; have long-term arts and community cultural development outcomes for communities; are initiated by and with the community. Partnerships can be with the non-arts sectors and specific target groups either within communities, between towns, within regions or across the state. Each partner must fulfill the eligibility criteria. It is expected that each partner contributes equally to the project through skills, financial and / or in-kind assistance. Priority will be given to projects that identify and create new partnerships and projects in which the partnerships are important in promoting sustainability. For Council’s information, as at 25 May 2009, the Grants Officer has applied for 45 grants totalling $9,363,529. Of that total Council has been notified that grants in the amount of $376,526 have been successfully approved. The remainder are still to be determined. There has been a debriefing on Council’s response to the flood event on 31 March/1 April 2009. Some issues were identified in relation to communication with the Mayor; the publicising of road closures and openings; working hours; environmental issues arising out of the clean up and the disposal of flood debris at the Waste Depot. 1 That Council request that the Department of Environment and Climate Change and other Departments associated with flood emergencies agree on a protocol for emergency clean up work. 2 That the General Manager’s Delegations of Authority be amended to allow fee exemptions for the disposal of waste arising out of natural disasters such as floods, storms and bushfires. Council has options in how it responds to emergencies, both during and immediately after the event. Where the Displan (Local Disaster Plan) is activated there is a more structured response. This report concerns recent flood events which did not require the activation of the Displan. On 18 May the Mayor, General Manager, Director Engineering Services, Senior Overseer and the Engineering Services Executive Assistant met to discuss a number of issues which arose out of the flood event on 31 March/1 April 2009. The matters discussed and the conclusions reached were as follows. Unlike the situation in the Bellingen Valley and at Coffs Harbour, this flood event was not of sufficient scale for the Police commander to activate the Local Emergency Management Committee and the Displan (Local Disaster Plan). Whilst this provided some advantage to Council operations in retaining key staff in the Administration building rather than at the NEOC building, communication was more fragmented, with the information flow to the Mayor often not keeping pace with demands from the public and media for information and comment. In such emergencies where the Local Emergency Management Committee has not been convened it is proposed that those Council staff directly involved in relief efforts, and particularly the Senior Overseer, communicate directly with the Mayor in relation to the status of the emergency and the relief work. The agency responsible for closing and opening roads is responsible for publicising the fact. Whilst it is generally Council undertaking these procedures, this is not always the case. Part way through the emergency it was identified that there was no readily accessible information on the status of roads and bridges and which were closed or open. At that stage the Executive Assistant undertook to place information on the status of roads and bridges on the front page of Council’s website. This was a great initiative and organised at very short notice. However it was agreed that back up assistance from other Executive Assistants would be required to manage incoming phone calls from residents, as well as from the SES and Council staff whilst the posting of new information to the website took place. It was agreed that all staff involved in the emergency need to be aware of not exceeding continuous working hours without the required break. In undertaking work to open bridges, roads and in emergency clean up, there were complaints directed at Council staff for ignoring environmental legislation. In particular, to open Lanes Bridge at Bowraville, an excavator was used to lift flood debris from the bridge and place it on the downstream bank. If this debris had to be cleared by hand and trucked away, the opening of the bridge would have been many hours later. Silt which has been deposited on roads and bridges is also hosed off by the Fire Brigade at the request of Council and also by residents. Given the turbidity of a flooded river it may be argued that such emergency work does not constitute pollution, however it would be desirable for the Department of Environment and Climate Change and other associated Departments such as Fisheries to agree on a protocol for emergency clean up works. There are matters concerning the river, responsibility for which seems to fall between the organisations which have regulatory involvement. An example is the removal of dead cows from waterways and beaches. Another is the removal of flood debris including plastic drums and trays from oyster leases as well as logs and vegetation from beaches. Where there is a natural disaster declaration such clean up works will be funded, however it is unclear who is responsible for the work. As Council is the authority with the most local staff it is recommended that it oversee such work in consultation with the Waterways Authority who are responsible for navigation. Following the February flood, the General Manager permitted residents to deposit flood debris at the waste depot at no charge. The fee exemption was subject to an assessment by Council’s Waste Management Officer of the debris to be removed and a voucher being provided for the quantity of material to be deposited. This worked satisfactorily and was also applied for the clean up of the March/April flood. It is recommended that the General Manager’s Delegations of Authority be amended to permit this practice. There has been consultation with the Mayor, Senior Overseer, Director Engineering Services, and Engineering Services Executive Assistant. The implications for the environment are discussed in the report. There are social issues caused by isolation. It is important that roads and bridges are opened as quickly as possible. In terms of minimising costs and business recovery it is important that roads and bridges are opened as quickly as possible. There are many risks in dealing with emergencies such as floods. This report considers some of these risks. At this stage it is difficult to determine what impact the flood events will have on Council’s budget. If the natural disaster grant scheme operates as it should then there should be minimal impact on Council’s budget. Council has been providing staffing assistance to Nambucca Valley Tourism Inc. to the value of approximately $30,000 per annum for tourism marketing activities as well as funding of $20,000 per annum. This support for marketing is in addition to the cost of operating the Visitor Information Centre. The Visitor Information Centre which is staffed by a part time co-ordinator (21 hours/week) plus 23 regular volunteers and 8 casual volunteers operates at a net cost to Council of $81,400 per annum. Council does not have sufficient staff resources to maintain the staffing assistance for marketing, ie the $30,000 identified above. That Nambucca Valley Tourism be advised that Council cannot continue to provide the previous level of staffing assistance for marketing and that enquiries for assistance with particular projects be made directly to the General Manager. If Council wishes to provide additional staffing support for tourism, then the source of funding will need to be identified. Council has been providing staffing assistance to Nambucca Valley Tourism Inc. to the value of approximately $30,000 per annum for tourism marketing activities as well as funding of $20,000 per annum. The work in tourism marketing has arisen mainly as a consequence of the O’Neill Report which is providing $ for $ funding for 3 years based on approved six monthly marketing strategies. So far two strategies have been prepared. An issue with the additional marketing money is that both Nambucca Valley Tourism and Council have to be members of Mid North Coast Tourism which is an additional cost of $2,500 per annum. Previously only Council was a member. Council does not have sufficient staff resources to maintain the staffing assistance for marketing, ie the $30,000 identified above. There is the possibility that future expenditure will be more focussed at the regional level rather than for a specific LGA. This would reduce the required staffing commitment, however Nambucca Valley Tourism should be advised that the previous level of staffing assistance cannot be maintained. There has been consultation with affected staff. The proposal has been referred to Nambucca Valley Tourism Inc. for their comment. They have previously advised that Council should be committing additional resources to tourism promotion and management, not less. The central issue is really about who should be driving tourism marketing in the Nambucca Valley. This issue was identified in the Tourism Strategy prepared in 2007. Council has in the past exercised “defacto” leadership but Nambucca Valley Tourism Inc. has recently become more active and involved in marketing initiatives. The preference for “standing alone” in terms of tourism management and marketing, as opposed to an alliance with an adjoining Council or the Coffs Coast poses additional financial challenges. It should be noted that in the Customer Satisfaction Survey conducted in 2007, tourism and tourism promotion were ranked as activities of low importance and high satisfaction. The economic implications cannot be readily determined. An evaluation of the benefit of the additional marketing expenditure provided by the O’Neil report is to be undertaken. There are no particular risks to Councils. The matter concerns the allocation of resources. There will be a budgetary impact if the existing level of staffing support is maintained as it will require additional part time or casual staff. At this stage there are no implications for working funds. On 11 May 2009, the Department of Local Government released for comment draft legislation and mandatory “guidelines” for integrated planning and reporting. In essence given the existing requirements, the new legislation will require additional planning documents being a Community Strategic Plan and Resourcing Strategy. As a means of managing a level of government the legislation is commendable. The Planning and Reporting “Guidelines” and the Planning and Reporting Manual represent current “best practice”. However at the broadest level, Councils are entitled to ask why their operations have to be regulated in such great detail. They are an elected level of government with a very high level of accountability and transparency in their day to day operations. Whilst the legislation has a desirable emphasis on the financial sustainability of Councils, it fails to consider what the role of local government should be. The legislation tends to view the process of strategic planning as being relatively infrequent and Council will incur additional costs in amending its plans as a consequence of sudden and unplanned changes in its operating environment. 2 Querying whether the new planning and reporting processes have sufficient flexibility to manage major structural change. 3 Querying how the new planning and reporting requirements will result in, “reduced red tape and streamlined reporting” (page 3 of Frequently Asked Questions). 4 That Council nominate to be in Group 3 for the implementation of the new requirements. 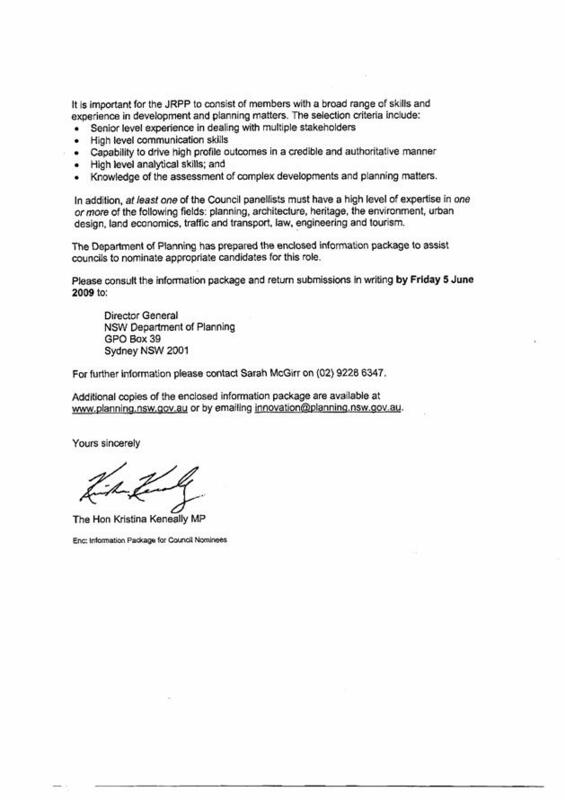 This will require the adoption of a Community Strategic Plan by 31 March 2012 and Delivery Program by 30 June 2012. The Local Government Act alone runs to 748 sections and many hundreds of pages and this doesn’t include its Regulations or new mandatory requirements such as those proposed by this legislation. The new requirements will add to the perception of excessive “red tape” and compliance costs. On 11 May 2009, the Department of Local Government released for comment draft legislation and mandatory “guidelines” for integrated planning and reporting. A copy of the Minister’s media release, the mandatory guidelines and frequently asked questions is in the circularised document. The draft legislation is not attached but can be found on the Department’s website. There is also a 106 page manual which is not attached but again can be found on the Department’s website. The Department is inviting comment on the draft Bill and Regulation up until 12 June 2009 and the draft Guidelines and Manual up until 3 July 2009. The existing Local Government Act provides that each year, a council is required to adopt a management plan that sets out its proposed strategy for at least the following 3 years, together with its proposed revenue policy for the next year. In essence given the existing requirements, the new legislation will require additional planning documents being a Community Strategic Plan and Resourcing Strategy. Council has already developed some, but not all of the requirements for a 10 year Community Strategic Plan as well as the Resourcing Strategy. Group 2: Community Strategic Plan adopted by 31 March 2011 and Delivery Program adopted by 30 June 2011. Group 3: Community Strategic Plan adopted by 31 March 2012 and Delivery Program adopted by 30 June 2012. The intent of the legislation to require Councils to apply a more strategic focus to their responsibilities and particularly to financial planning and asset management is laudable. Notwithstanding additional planning and reporting requirements will come at a cost. With increased planning horizons there is also the question as to how Councils’ will manage significant change which may occur in the short term, for example the global financial crisis or proposed water utility reforms. Such changes may make the Community Strategic Plan and Delivery Program partially redundant, requiring on-going review and amendment. It is proposed that the following matters be referred to the Department of Local Government for their consideration. “We want to increase education opportunities in our area”. Council’s customer satisfaction survey undertaken in 2007 indicated there is general confusion in the community as to the role of local government with Council often being blamed for dissatisfaction with services provided by the State Government. It is not clear why Councils should be considering priorities and aspirations for which they are legally and financially incapable of delivering. Whilst it is not mandatory to consider functions undertaken by other levels of government, in reality it will be difficult to exclude them when discussing the community’s general aspirations and where other Councils incorporate them. 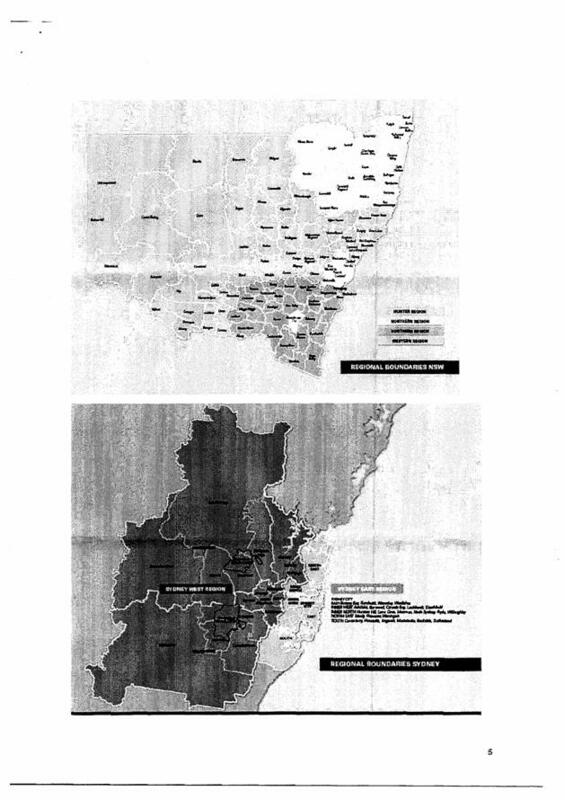 In the terms of the Allen Report (Independent Inquiry into the Financial Sustainability of NSW Local Government 2006), this is the maximalist view, that a Council is the government of its area – concerned with the welfare of the whole community, even if this means duplicating the roles of other tiers of government. “Although Councils and their communities will plan ahead for 10 years, it is not expected that the plan will be set in stone for that period. The community will have a chance to revisit the Community Strategic Plan every four years when its new Council is elected. It may wish to change the priorities or objectives of the Community Strategic Plan if something significant has happened during that period, or revise the strategies if a particular course of action hasn’t proven effective…. It is also possible for the community to change the Community Strategic Plan within the council term if required, but this should only occur if there is a fundamental change that affects the whole community. An example might be a natural disaster such as a major storm, bushfire or flood that severely damages community infrastructure. Or, there might be a significant change in the local government area’s boundary. Community engagement is required whenever significant changes are proposed to the Community Strategic Plan. “Significant changes” would be those that require changes to the objectives of the plan, or the strategies outlined in the plan”. The community engagement process is formal consultation process requiring the preparation of a community engagement strategy. Whilst there is no standard format for the strategy, it is intended to be a thorough process of engaging with the community by providing information; seeking information and involving the community in working through the issues raised. There is the real possibility that structural change in local government such as the proposed water reforms or Council amalgamations will render a significant part of the plan redundant and impose additional costs for its revision. Unilateral decisions by the State Government in relation to structural change would also undermine the value of the engagement process. The deadline of 12 June for comments in relation to the draft bill and regulation makes it difficult to undertake broad based consultation. At this stage there are no perceived implications for the environment. The requirement to prepare a State of the Environment Report has been maintained. The legislation and guidelines are much stronger in relation to community engagement. This is a positive albeit with the concern that it will come at an additional cost and pose challenges in managing major unexpected change. At this stage there are no discernible economic impacts. The new legislation will require additional statutory reporting which will come at an additional cost. Fortunately Council has made some progress in relation to a community strategic plan and is building its capacity in relation to asset management, workforce management and long term financial planning. Council’s existing in-house resources should be able to meet most aspects of the new planning and reporting requirements. § Concern with the upkeep of Wards Road and dust impacts – previous requirement was to seal the road. 27/04/09 Amended plans and Bushfire Report referred to NSW RFS – awaiting response. This report outlines the Bonds that have been required through several Development Consents associated with Extractive operations at Wia Ora and their subsequent release. 1 That Council note the circumstances regarding the release of two bonds associated with Extractive Operations and Processing Plant at Wia Ora. 2 That Council note the potential conflicts and additional costs should Council proceed to call in the bonds prior to the matter being resolved between the operators and the Department of Water and Energy in regard to the disputed outstanding works. 3 That Council advise its insurers of a possible claim in this matter if not resolved between the operator and the Department of Water and Energy. Whilst Council has several options the recommendations are considered the most appropriate at this time. When considering the release of the final two Bonds held by Council relating to Extractive Operations at Wia Ora at its 19 March 2009 Ordinary Meeting, Council sought a report on the circumstances regarding the previous release of bonds associated with the operations by Wia-Ora Sand and Gravel, Mac'scon and Mac'sville Concrete in this locality. 2f All buffer areas to be adequately fenced from stock. Proponent to submit a revised Landscape Plan by a suitably qualified person to Council and DLWC within one month of determination of consent. Landscape Plan must include a schedule of buffer establishment and annual reporting by suitably qualified person on functionality of five years planting for pits A, B1, B2 and B3. Retention of a performance bond of $5,000 held by Council to be linked to Landscape Plan and reporting. Species selection to be consistent with publication Revegetating Streams in the Nambucca Catchment – A Guide to Species and Planting Methods. Buffers to remain in place for the life of any dam structures remaining after the initial extractive development stage. The owner to provide a Deed of Agreement supported by a Caveat, at his cost, on the land title deeds for a period of five years ensuring the buffer becomes well established. 20 The applicant shall provide a bank guarantee, in the sum of $8,000 in favour of Council, being the sum necessary to ensure due completion of the rehabilitation and vegetation works described in conditions 10(a) and (b) (Landscape Plan) and 19 (Site Rehabilitation Plan). The bank guarantee only being released upon effective rehabilitation works being undertaken and establishment and maintenance of buffer plantings to the satisfaction of Department of Land and Water Conservation. 13 The applicant shall provide a bank guarantee, in the sum of $2,000 to be linked to DA3040, in favour of Council being the sum necessary to ensure due completion of the rehabilitation and landscaping works required of condition 11. In the event rehabilitation works are not undertaken in accordance with this consent, Council may use the guarantee to have appropriate rehabilitation works undertaken. Note: Council accepts the $2,000 paid with DA3040 as also meeting this condition an the basis the amount will not be refunded until works required of DA 2001/093 and DA3040 are satisfied. It should be noted that the $2,000 bond referred to in condition 13 for DA2001/093 is not an additional bond, but rather the same as required by condition 11 for DA 3040 above. The current bonds held by Council are the $2,000 (Sites A & B) and $10,000 (Site C) required by conditions 11 (DA 3040 22/09/1993) and condition 5i (DA 1995/102) respectfully. The Landscape Plan as required by condition 2f above for DA DA3040 T1-9-485 (Modified Consent 21 August 2000) Sites A, B1, B2 & B3 was submitted and subsequently signed off by DLWC on 1 November 2000. The $5,000 bond by way of Bank Guarantee was received by Council on 17 November 2000. The Caveat was registered on 8 May 2001. Discussions commenced in November 2001 in regard to rehabilitation works completed and underway at the above Extractive Operations and Processing Plant. The following letter from DLWC was received by Council on 4 December 2001. The Annual Report as referred to in the above letter was received by Council on 30 July 2002. The report was assessed by Council staff and forwarded to the relevant agencies for comment. During the following 12 months a number of issues, inspections and discussions were held between the operators, Council staff and agencies as it was evident that there were varying levels of opinion between the agencies above letter, onsite discussions and the operators horticulturalist as to the adequacy and compliance of the rehabilitation buffers and plantings. 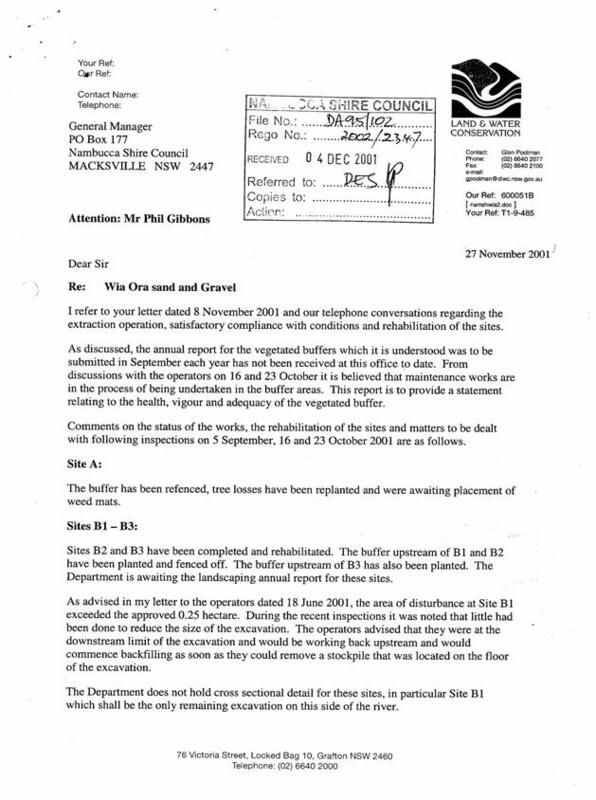 A number of meetings were held (21/07/03, 11/09/03, 6&13/11/03 and 10/12/03) in regard to the operations on site between the agencies, operators and Council resulting in a number of letters being issued. Further meetings were held in early 2004 resulting in the detailed response prepared by the then Department of Infrastructure, Planning and Natural Resources which critically examined and detailed the anomalies and requirements for the extractive operations and compliance with consent conditions, noting this was some 30 months after the above letter and in the midst of the drought. As Council is now aware this is the current point of dispute with the extent of works required by the now Department of Energy and Water and the dispute by the operator which remains unresolved at this point in time. Notwithstanding, the questions raised by Council as to the process relating to the release of the two bonds and the possibility of calling in the bonds and Council undertaking the works is outlined below. The two bonds (Bank Guarantees) of $5,000 and $8,000 respectively, were returned according to Council’s records on 21 February 2005. 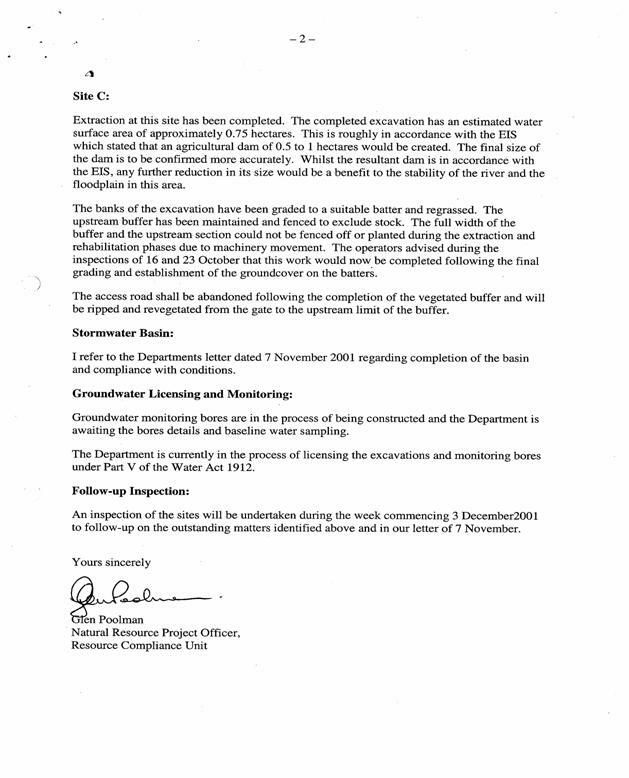 After extensive investigation into their return there does not appear to be any written record as to the authority to return the bonds other than the assumption that as the Bank Guarantees had a “Termination Date” of 31 March 2001, an audit was undertaken and those identified as “Terminated “ appear to have been returned to the respective banks. Noting that there was another unrelated Bank Guarantee retuned on this same date (21 February 2005). Of the two bonds only the $5,000 bond related to the gravel extraction rehabilitation activities, whilst the $8,000 bond related to the “Enlarged Stormwater Retention Basin” associated with the crushing and processing operations which had ceased in December 2003 and the property subsequently sold. As can be read in condition 2f for DA3040 T1-9-485 (Modified Consent 21 August 2000) Sites A, B1, B2 & B3, the only reference to and requirement from a government agency was the appointment of a “suitably qualified “ horticulturalist" to prepare the Landscape Plan. As discussed previously in the report the two remaining bonds relate to Site C ($10,000) and Sites A, B1, B2 & B3 ($2,000). The former operators have renewed both of the bonds since they wound up the company and do not have a “Termination Date” attached to them. However, the operators wish to finalise this matter and have both bonds returned. Council also sought advice into the possibility of calling in the two bonds (Bank Guarantees) to have any outstanding works completed. Whilst it is quite open to Council to proceed to call on the bonds, it is something that should be considered with caution in light of the discussions and disagreement that took place onsite at Council’s General Purpose Committee meeting in March this year. Should Council proceed to "call in" the bonds and proceed to have the works completed and a budget short fall arose, Council would have to find the balance of funds and then pursue the operator through the courts which may very well cost the ratepayers considerably more and may never be recouped. Until the disputed matters are finally resolved between the operator and DWE it is recommended that Council continue to hold the bonds (Bank Guarantees) until some agreement or compromise is achieved. There are no environmental impacts arising from this report. The works that the Bonds are tied to relate to performance, maintenance and rehabilitation of extracted/disturbed land associated with approved developments. There are no social impacts arising from this report. The works that the Bonds are tied to relate to performance, maintenance and rehabilitation of extracted/disturbed land associated with approved developments. There are potential private and public economic impacts arising from this report as the works that the Bonds are tied to relate to performance, maintenance and rehabilitation of extracted/disturbed land associated with approved developments. There are considerable risks arising from this report as the works that the Bonds are tied to relate to performance, maintenance and rehabilitation of extracted/disturbed land associated with approved developments and if not finalised Council could face the risk of having to pursue the matter or be pursued itself through the Courts. Non required at this stage. 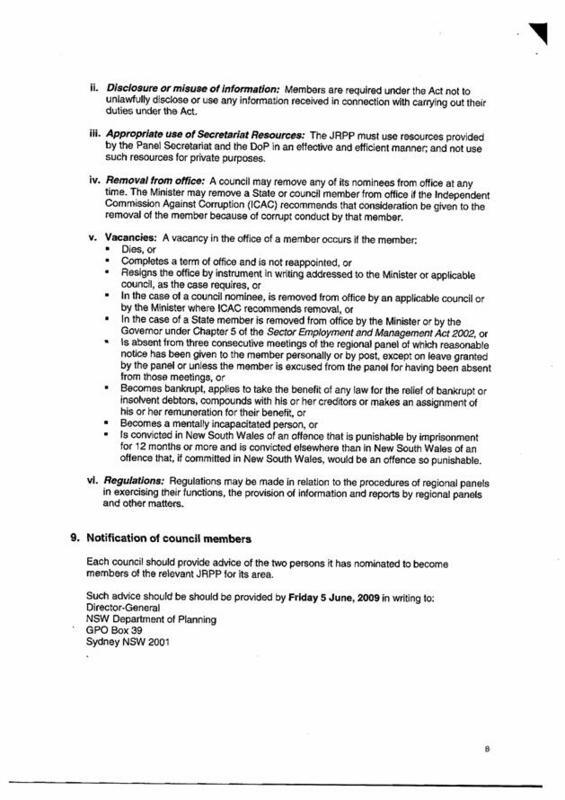 The minutes contain one recommendation for Council's consideration which relates to the endorsement of the Committee following the election of office bearers and committee. That Council note the minutes from the Annual General Meeting held on 12 May 2009 and endorse the voting membership to the Aboriginal Community Advisory Committee of Ms Cathy Bula (Chair), Ms Raylene Ballangarry (Deputy Chair), Mr Michael Donovan, Mr Darren Kershaw, Mr Robert Wilson, Mr Colin Jarrett, Mr Gary Williams, Mr Caine Rosser, Ms Paula Craig, Mrs Jennifer Rosser, Mr Barry Donovan, Mr Semi Bula, Ms Beryl Wilson, Mr Neville Kim, Ms Kimberly Jones, Mr Michael J Donovan, Ms Belinda Donovan, Ms Mila Bula, Ms Tamara Smith, Mr Anthony Gillin, Mrs Rachel Gillin, Ms Penny Stadhams, Ms Vicki Power, Mr Scott Mieni, Ms Patricia Gail Ling, Ms Louise Robinson, Ms Michele Donovan, Ms Karen Ella-Bird, Ms Marcia Hillery, Mr Terry Marshall, Mr Larry Kelly, Ms Ann Edwards, Ms Tracy Cohen, Mr Dean Jarrett, Mrs Tracy Singleton, Ms Shirley Ballangarry. Council's Community Development Officer, Patricia Walker, will only provide secretarial support and is not a voting member of the Aboriginal Community Advisory Committee. Manager Community and Cultural Services Comments: The minutes recommend the endorsement by Council of the minutes of the previous AGM. These were in fact endorsed by Council on 15 March 2007. Councillors Ballangarry and South are already endorsed members of the Committee as per Council’s resolution regarding delegates to Committees on 2 October 2008. Cr Flack is an alternate delegate as per Council’s resolution of 5 February 2009. RECOMMENDATION: That on the motion of Ms Jennifer Rosser seconded by Cr Ballangarry that the minutes of the previous Annual General Meeting 20 February 2007 be accepted and be endorsed by Council. Motion carried and accepted by all members present. Mrs Cathy Bula Chairperson welcomes everyone and informs members that the AGM will be first. She comments that even though there have been several attempts made for the ACAC annual general meeting, we finally have got there. A discussion ensued about current membership and the Nomination Form. Members present discussed that there is a Members List. This List is only updated when addresses change or new membership is applied via a Nomination Form, and, when that new member has been endorsed by Council. Note: ACAC is the only Council committee that have a Nomination Form. Ms Beryl Wilson entered the meeting 10:50 am. On the motion of Mr Barry Donovan seconded by Ms Jennie Rosser Cr Ballangarry was appointed the Returning Officer for the election of Office Bearers. Cathy Bula thanked Council for projects that were successful and unsuccessful. She also thanked Patricia for meeting agendas. Ms Cathy Bula and Mr Michael Donovan stood down as Chairperson and Deputy Chairperson, respectively. Cr Ballangarry then called for nominations for Chairperson. There were three nominations to the position of Chairperson. Ms Penny Stadhams nominated Ms Raylene Ballangarry seconded by Vicki Power. Raylene Ballangarry accepts nomination. Ms Cathy Bula nominates Mrs Michele Donovan. Mrs Donovan declines nomination. Ms Jennie Rosser nominated Cathy Bula seconded by Michele Donovan. Cathy Bula accepts nomination. Ms Cathy Bula nominates Ms Beryl Wilson. Ms Wilson declines nomination. Ms Beryl Wilson nominates Mr Barry Donovan seconded by Ms Cathy Bula. Mr Donovan accepts nomination. Three calls were made for more nominations to Chairperson. Voting declared closed. For voting preference, members agreed on secret ballot. Members voted and handed papers to Cr Ballangarry. Cr Ballangarry proceeded to count the votes at the back of the room. Ms Cathy Bula was declared as Chairperson for the 2009-2010 Aboriginal Community Advisory Committee. Cr Ballangarry calls for nominations for Deputy Chairperson. Ms Beryl Wilson nominates Mr Barry Donovan seconded by Ms Jennie Rosser. Ms Penny Stadhams nominates Ms Raylene Ballangarry seconded by Ms Mila Bula. Ms Ballangarry accepts nomination. Ms Cathy Bula nominated Ms Jennie Rosser. Ms Rosser declines nomination. Ms Cathy Bula nominates Mrs Michele Donovan seconded by Mr Barry Donovan. Mrs Donovan accepts nomination. Three calls were made for more nominations for Deputy Chairperson. Voting declared closed. Votes were counted by Cr Ballangarry at back of the room. Ms Raylene Ballangarry declared as Deputy Chairperson for the 2009-2010 Aboriginal Community Advisory Committee. It was noted that secretarial support be provided by Council staff, Ms Patricia Walker. RECOMMENDATION: On the motion of Michele Donovan seconded by Barry Donovan that voting members of Aboriginal Community Advisory Committee during 2009-2010 are Ms Cathy Bula (Chair), Ms Raylene Ballangarry (Deputy Chair), Mr Michael Donovan, Mr Darren Kershaw, Mr Robert Wilson, Mr Colin Jarrett, Mr Gary Williams, Mr Caine Rosser, Ms Paula Craig, Mrs Jennifer Rosser, Mr Barry Donovan, Mr Semi Bula, Ms Beryl Wilson, Mr Neville Kim, Ms Kimberly Jones, Mr Michael J Donovan, Ms Belinda Donovan, Ms Mila Bula, Ms Tamara Smith, Mr Anthony Gillin, Mrs Rachel Gillin, Ms Penny Stadhams, Ms Vicki Power, Mr Scott Mieni, Ms Patricia Gail Ling, Ms Louise Robinson, Ms Michele Donovan, Ms Karen Ella-Bird, Ms Marcia Hillery, Mr Terry Marshall, Mr Larry Kelly, Ms Ann Edwards, Ms Tracy Cohen, Mr Dean Jarrett, Mrs Tracy Singleton, Ms Shirley Ballangarry. Returning Officer steps down and hands over the ordinary meeting to Ms Cathy Bula, Aboriginal Community Advisory Committee Chairperson who declares the meeting closed. There being no further business the meeting closed at 11.15 am. RECOMMENDATION: That on the motion of Ms Beryl Wilson seconded by Penny Stadhams that the Aboriginal Youth Worker report to ACAC, either in person or by a written report. 1 That Council note the Committee’s request for a written or verbal report from the Aboriginal Youth Worker. 2 That the remaining minutes of the Aboriginal Community Advisory Committee held on 12 May 2009 be noted. Manager Community and Cultural Services comment: The Youth Worker would be providing an update on recent activities, programs or youth issues for the information of the Committee. Ms Cathy Bula, (Chairperson) Councillor Martin Ballangarry, Ms Mila Bula, Mrs Michele Donovan, Mrs Jennie Rosser, Mr Barry Donovan, Ms Vicki Power, Ms Raylene Ballangarry, Ms Penny Stadhams, Ms Beryl Wilson. Cr. South, Ms Kerry Grace, Mr Michael Donovan, Mr Caine Rosser, Mr Semi Bula, Ms Kerry-Ann Jarrett, Mr Gary Williams. The Chairperson commenced the meeting by going over the aims and objectives of the Committee and a reminder to support the ACAC on a regular basis and gave congratulations to Ms Raylene Ballangarry for her appointment as Deputy Chairperson. Ms Bula said that there is a long road ahead and encouraged others to support ACAC. The Chairperson addressed these procedures. Previous Minutes – 16 December 2008. Mr Barry Donovan inquired about refurbishment at Darimba Maara. Works had started but had ceased. The CEO was on leave for a month. Looking for more dollars for refurbishment. Aboriginal Connections received tender for the works. Ms Beryl Wilson will follow through with enquiries in regards to the refurbishment. Ms Patricia Walker updated members on the traineeship. Ms Walker explained that this is the second round of advertisement, there were 6 applications. Interviews are on Friday 15 May 2009, with the position being filled late May 2009. Interview panel is Lyn Larsen (NSW Department of Sport and Recreation), Ritchie Donovan (Trainer) and Patricia Walker. Ms Patricia Walker explained that the General Manager, Michael Coulter had approached her about rotations of ACAC to the LALC's. Ms Beryl Wilson said that this is a good idea and members agreed. Ms Bula said that ACAC had tried this before and will try again. CDO to request LALC's approval of hosting an ACAC. If no space available, CDO to consider and assist LALC with venue. All members agreed that Bowraville LALC will be approached first because of new CEO and to introduce him to the wider community. NAIDOC is hosted by Bowraville this year. The march is being re-routed and finalisation of the program was held recently at a meeting. Mr Barry Donovan to see about volunteers for marshalling during the march. Mr Donovan will liaise with the local Police for that day and report at next ACAC. Ms Raylene Ballangarry encouraged everyone to participate in this year's NAIDOC, that the program is for the whole community. Ms Mila Bula to contribute fruit to Day 3's activities held at Bowraville Central School's gym. Community Development Officer – Nambucca Heads LALC letter of support for the Community Savers Stream. Ms Jennie Rosser (TAFE) – Statement of Attainment course will be starting next term at Macksville Campus of TAFE. The course will run one day a week for 3 hours and will eventually become a certificate course. Ms Beryl Wilson (Ngurrala) – CDEP will be terminating in June 2009. Participants are receiving major support during the transition. Births, Deaths & Marriages are assisting by proving information about certificates. BBQ is scheduled for the 20 May 2009. Ms Cathy Bula (New Careers for Aboriginal People) – NCAP has moved from Wallace Street to 1/12 Cooper Street, Macksville. Ms Bula has put out tenders but there is uncertainty of what is happening after 30 June 2009. NCAP's Senior Coordinator has resigned and taken up an appointment with DADHC. There will be 90 positions with Department of Ageing Disability and Home Care/DADHC across the NSW and will be training Aboriginal people in Port Macquarie to run residential facilities for the aged. Ms Vicki Power (Community Facilitator – Bowraville Commonwealth Shared Responsibility Agreement/CSRA) – Every third Wednesday there is a morning tea held at MiiMi for service providers, next morning tea is scheduled for 20 May 2009. A Men's Group has started as well. MiiMi has a 2 year lease on the old 'Butter Factory'. There are 6 sheds which will be used for activities and will considering renting office space. Ms Penny Stadhams (Department of Aboriginal Affairs) – Her position is to set up networks and strengthen existing ones, assist with body governance. Ms Stadhams tabled information on her role in the community. Ms Stadhams would like the CDO to follow up on where Council is at for James Park in Bowraville. Ms Stadhams is under the impression that Council had come to an agreement with the Committee of Management about the upgrade of James Park. Ms Mila Bula (Aboriginal Aged Care) – has moved to 23 Cooper Street, Macksville and has informed ACAC that Nyambaga has moved to Bowraville. Cr Ballangarry – Missabotti Hall has a TAFE course in cementing/paving. The course is a Statement of Attainment with 5 participants taught by Mark Selby. Members agreed to set meetings to the third Tuesday of the month. The meeting concluded at 11:55 pm. 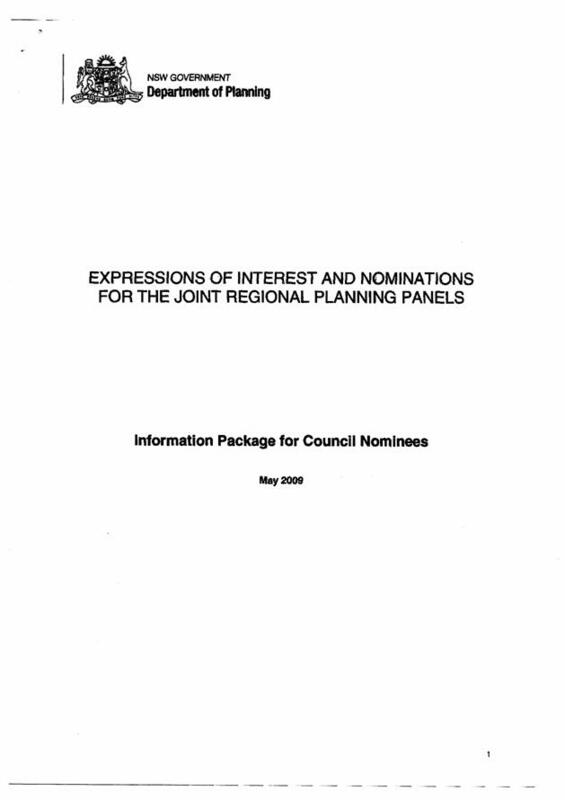 Council has been requested by the Department of Planning to nominate representatives to serve on the Northern Region Joint Regional Planning Panel (JRPP). 1 That Council request an extension of time to enable further consultation and discussions with adjoining Councils on options for resource sharing to address concerns relating to potential conflicts of interest by Council nominated representation. 2 That the Department be advised that in the event an extension is not granted and subject to formal agreement with Kempsey Shire Council, Nambucca Shire nominate the Mayor of Kempsey Shire Council and Director Sustainable Development for Kempsey Shire Council as its Nambucca members for the JRPP, with the Deputy Mayor of Kempsey Shire being the alternative representative. 3 Council nominate the Mayor and Director Environment and Planning to represent Kempsey Shire Council on the JRPP for matters applicable to their shire with the Deputy Mayor being the alternative representative. 4 That in the event that Kempsey Shire do not formally agree to the proposed resource sharing proposal Council nominate the Mayor and Director Environment and Planning to represent it on the JRPP with the Deputy Mayor being the alternative representative. Should Council choose to nominate two local representatives other then the Mayor and Director Environment and Planning, Council will need to determine how it proposes to identify the representatives, either from the elected Councillors and Staff or through the calling of Expressions of Interest, and nominate prior to the closing date of 5 June 2009. 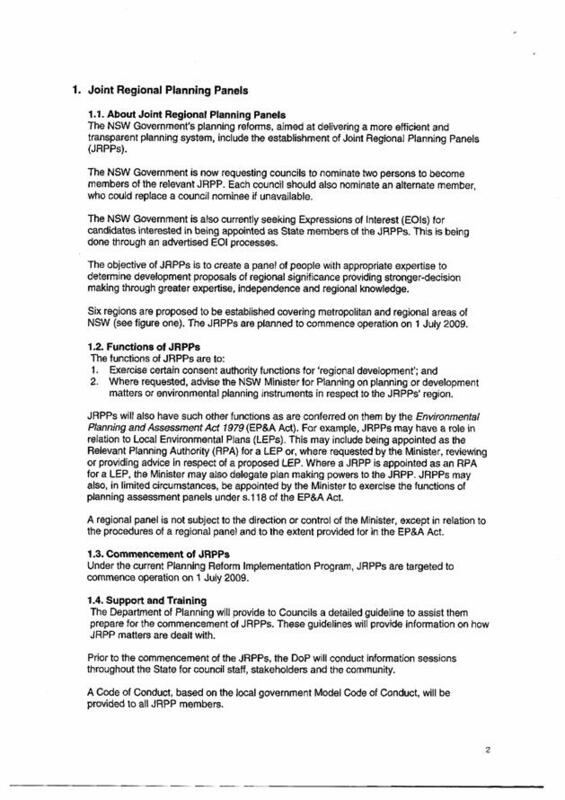 The purpose of the JRPP is to act as the consent authority for all DAs deemed to be of regional significance and to advise the Minister in respect to any planning matter or planning instruments in respect to the region. · Development where the council is the proponent or has a potential conflict of interest. Basic guidelines in the form of a Selection Criteria for members have been provided to assist Council in the calling of Expressions of Interest and consideration of applicants. The representatives need not be an elected Councillor or Council staff member. However, finding someone in the community who may fit the criteria and willing to sit on the Panel may be a challenge. 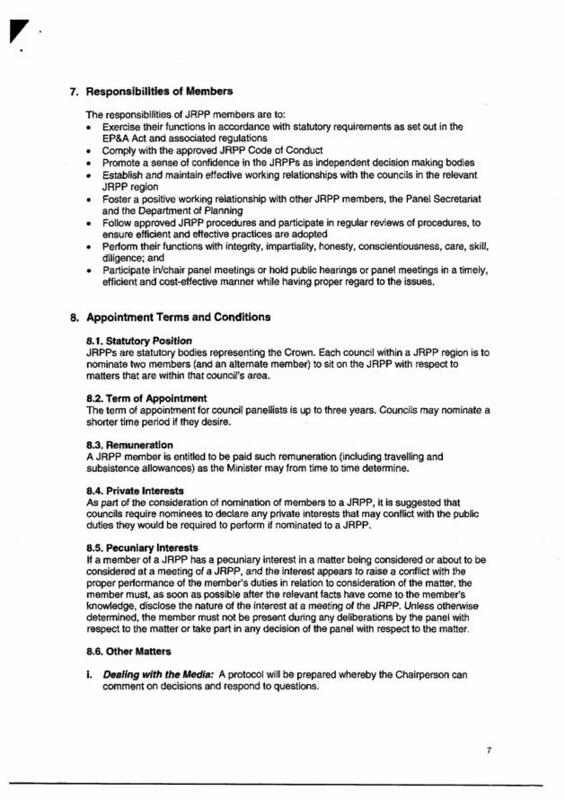 The Department has advised that in nominating a member, Council needs to fully recognise that the person would be expected to act independently of Council and should not be subject to influence by other Councillor or Council Officer on matters to be determined by the JRPP. 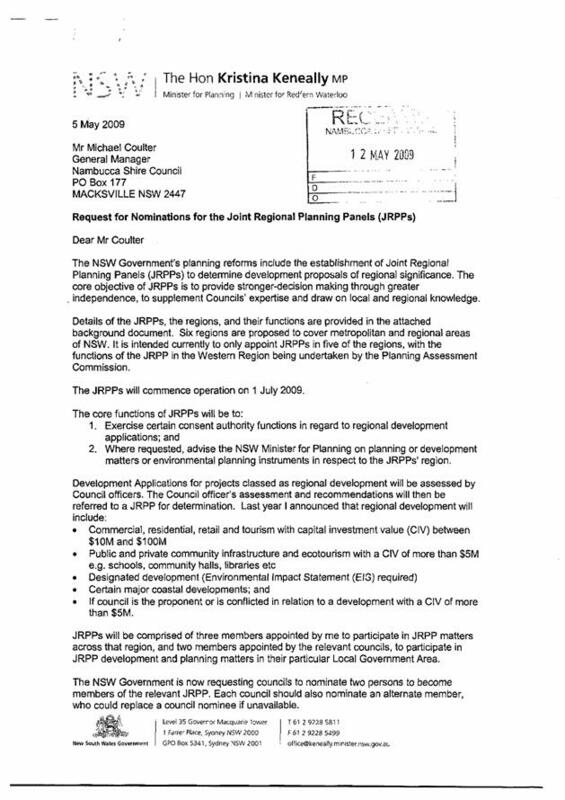 The consensus amongst the Local Government Planning Directors Group (the Group was formed to raise concerns relating to the NSW planning reform agenda and meets regularly with the Minister and senior officials) is that Local Government planning directors/managers cannot represent their respective councils on a JRPP as they have an inherent conflict of interest as they are also responsible for preparing the planning assessment report for presentation to and consideration of the JRPP. Advice provided by an internal auditor at a large metropolitan council suggests that elected councillors would also be placed in a conflict of interest between their obligations to represent the interests of their community and to act as a member of an independent external planning panel. 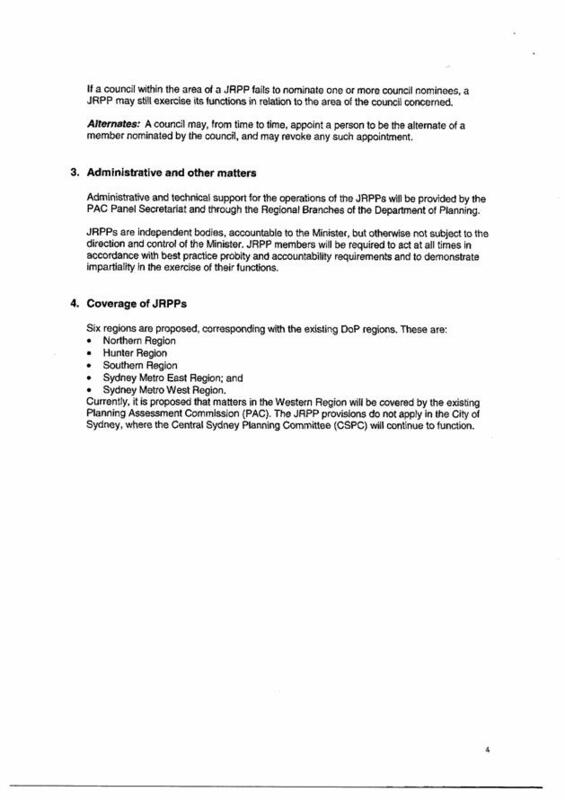 In order to address this conflict of interest, the idea has been floated within MIDGOC GMs to consider a resource sharing arrangement whereby the nominated representatives from each council would serve on the JRPP for matters relating to other councils in the MIDGOC, thereby avoiding conflicts of interest, whilst maintaining suitable representation on the JRPP. This would also provide the opportunity for the council appointed members to make representations directly to the JRPP in support of a submission on any matter relating to their LGA. However, should other MIDGOC Council's be interested in this initiative, an extension to the restrictive time frame of 5 June 2009, should be sought. Discussions have been held with Officers of Kempsey Shire Council where both Councils would each nominate 2 members to sit on the JRPP for the respective councils. The proposed nominations would be referred to each Council for endorsement and submission. · Both councils are of similar size, have similar demographic profiles, experience similar types of development and are affected by similar constraints. · The number of applications to be dealt with by the JRPP for both Councils is expected to be similar (very low possibly 6 – 12 per year), thereby representing an equitable cost to each council. · Whether the JRPP, including travel and accommodation costs of State nominated members is to be funded. It has previously been suggested that the costs should be borne by the host councils. 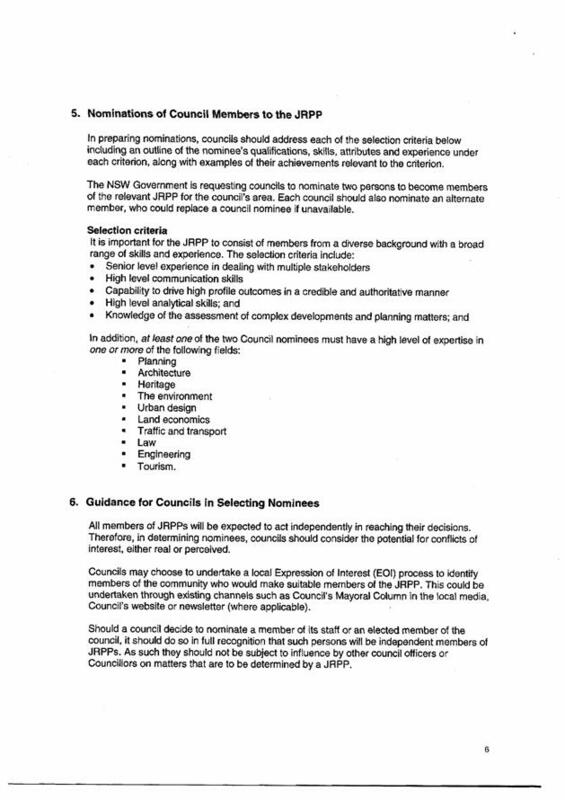 NOTE The Department has advised that if a council fails to nominate members for the LGA, the JRPP may still exercise its functions within the LGA. The proposal for JRPP may not necessarily provide for better environmental considerations or outcomes. The proposal for JRPP may not necessarily provide for better social considerations or outcomes. No information has been provided to determine the cost implications for councils or applicants in respect to how the JRPP will be funded. 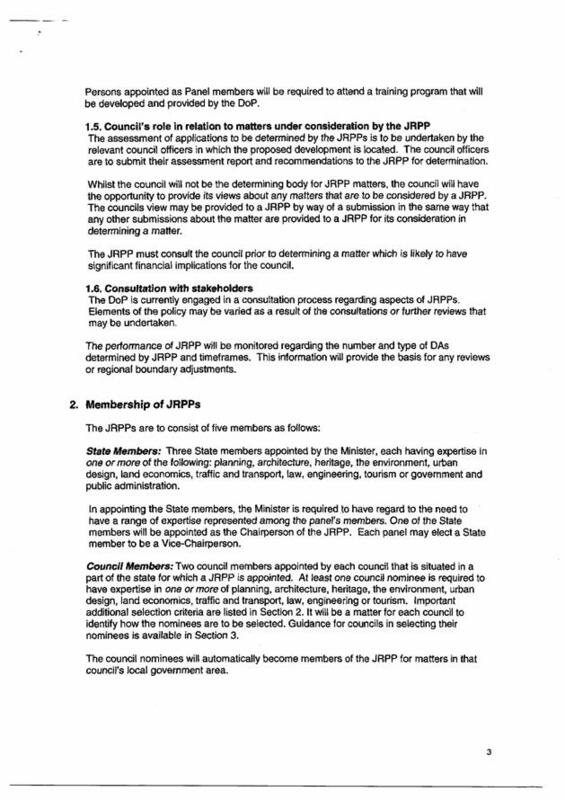 Council will still have the opportunity of making representations to the JRPP if desired. The risk for Council is that if it chooses a Councillor and staff member to represent it on the panel they may not necessarily represent the majority view or position of Council. General Fund and DA fees. This report is to advise Council that National Aboriginal and Islander Day of Celebration (NAIDOC) Week will be held Sunday 5 July – Saturday 12 July 2009 and to seek Council's endorsement for a Council-hosted event being a Flag Raising and Morning Tea. This will confirm agreement in principle provided to the Committee by Council’s General Manager in February. 1 That Council note NAIDOC Week is scheduled for Sunday 5 July to Saturday 12 July 2009 with the theme 'Honouring Our Elders, Nurturing Our Youth', and the many activities programmed to occur during the Week. 2 That Council host a Welcome to Country, Flag Raising and Smoking Ceremony to be held at Council's Administration Centre Monday 6 July 2009 followed by a Morning Tea and Photo Exhibition. Council has the option of not conducting a NAIDOC Week activity on and/or within Council premises. Council's Community Development Officer has been very active in contributing to the NAIDOC Committee program and the final touches were resolved recently. The NAIDOC Committee's plan for Monday 6 July 2009 is an Official Welcome to Country and a Smoking and Flag Raising Ceremony at the Council's Administration Centre commencing at 9 am. This will be followed by a morning tea at Council. The proposed Ceremony will take approximately two and half hours and is unlikely to disrupt Council Staff or the community. Invitations will be issued to all Councillors and Senior Staff, together with Elders and two student representatives from local schools. Also as a part of Council’s contribution to NAIDOC Week Council’s Aboriginal Youth Worker and Community Development Officer will be undertaking a Photo Exhibition at Macksville Library. The exhibition will follow the NAIDOC Week theme of 'Honouring Our Elders, Nurturing Our Youth' and will focus on portrait photos of local Gumbaynggirr Elders and young people. The project will revisit the Building Bridges photography project of 1993. This event has the potential to be a promotion of the local libraries, and receive community input into the expansion of the Aboriginal collection within the libraries. Attached for Councillor’s information is the proposed program for the local NAIDOC Week celebrations. This is identified as a low risk activity.